In the wake of Russian protests for free and fair elections— one of the hallmarks of democracy— the international community has again turned its attention on democratization in the post-Soviet region. Democracy, in its various forms, represents something different to everyone. So what does it mean for Georgians? Do Georgians consider Georgia to be a democratic state in its present form? 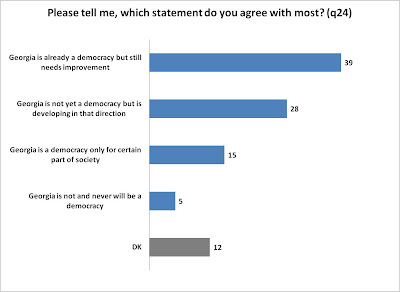 What are their perceptions of democracy? CRRC, on behalf of the National Democratic Institute-Georgia, conducted a repeated survey on public attitudes in Georgia from November 2008 to September 2011 in which respondents were asked a series of questions about democracy. Survey results show that just under half of the population considers Georgia to be a democracy. Also, most Georgians associate democracy with liberty, freedom of speech, media and expression, rather than government accountability and free and fair elections. From April 2010 to September 2011, Georgians were asked ‘Is Georgia a democracy now’? 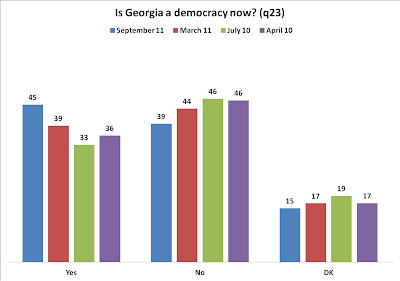 The figure below shows that since July 2010 there has been a steady increase in the percentage of Georgians who believe Georgia is a democracy with 45% believing so in September 2011. When asked to gauge the extent of Georgia’s transition to democracy in the September 2011 survey, 39% of Georgians said ‘Georgia is already a democracy but still needs improvement’, while 28% said Georgia is not a democracy, but is moving in that direction. In contrast, only 5% of Georgians believe Georgia is not and will never be a democracy. Thus, the data shows that just under half of the population (45%) considers Georgia to be a democracy, and many people believe Georgia is either already a democracy that needs improvement or is not yet a democracy but is still developing in that direction. But what does democracy mean to Georgians? 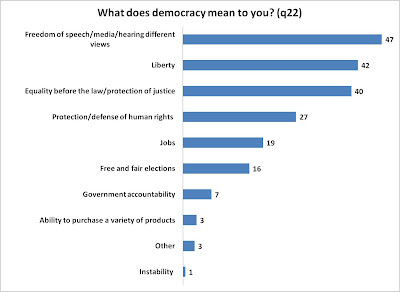 The 2011 survey asked, ‘What does democracy mean to you?’ 47% of Georgians interpret democracy to mean freedom of speech/media/hearing different views. 42% associate democracy with liberty and 40% say equality before the law/protection of justice. In contrast, only 7% say government accountability and 16% think democracy means free and fair elections. The results elicit a strong difference in the Georgian interpretation of democracy which prizes liberty and freedom of speech/media/hearing different views above free and fair elections. Respondents were allowed to provide their own responses. The percentages do not add to 100% because respondents could name up to three items. Thus, survey data tells us that the percentage of Georgians who think Georgia is a democracy is increasing over time, that there is room for improvement, and that the concept of democracy is more associated with liberty and freedom of speech/media/hearing different views, than government accountability and free and fair elections. This is important in light of recent global events in which ordinary citizens have begun to challenge their state systems and certain features of their democracy. How do you think Georgia fairs on its path to democracy? Has Georgia reached its goal or is there still room for improvement?